The aluminum grade of aluminum strips for lamp base is 1050 aluminum alloy,1060 aluminum alloy, 1070 aluminum alloy, 1100 aluminum alloy, 3004 aluminum alloy, 3003 aluminum alloy, the most common seen is 3004 aluminum strip for lamp base(temper O). The temper is mainly H22 and O(fully annealed state). 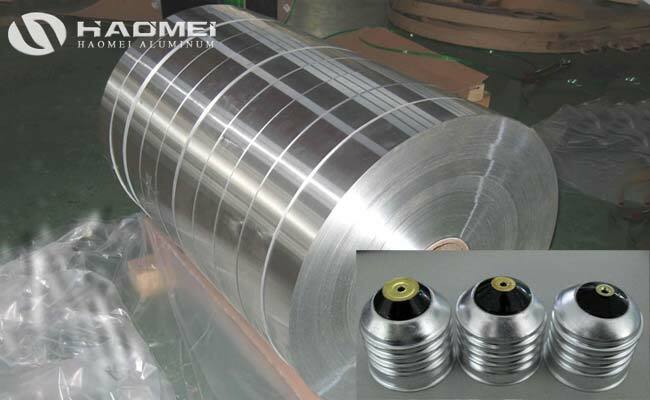 The product type can be sheet and coil. The common thickness is 0.7mm, 0.8mm and 1.0mm, or according to customer requirements, the thickness tolerance ±0.01mm. The width is 50-1500mm. The aluminum lamp base produce from 3004 aluminum strip has beautiful and smooth surface than other alloy, and there is no orange peel on the surface. According to the experience, casting aluminum strip material is more suitable for processing lamp base, 3004 aluminum strips has the advantages of gflexibility, high forming strength, excellent electrical conductivity, stable continuous stamping process, neatly trimming, and significant oxidation plating effect.